Home > METRIC V-BELTS > K Section Metric V Belts for Specialty Machine Tools. > K22 Metric V Belt. BANDO K22/K559 Industrial V-Belt. > K21 Metric V Belt. K21/K533 Industrial V-Belt. CURRENTLY IN STOCK. ORDER NOW AS SUPPLY IS LIMITED! K21 Metric V Belt. K21/K533 Industrial V-Belt. 5/16” Wide x 21” EFFECTIVE Length (533mm) - these belts are 22" OUTER CIRCUMFERENCE. 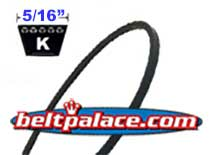 Superior replacement for Import brand Metric K21 V-Belts. Used for durablility and extra long service life. Heat, static, and oil resistant. 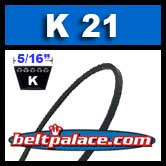 Import brand K21/K333 Metric V-Belt. V-Belt Standard K Type K21. Machine Transmission Band Wedge Rope K-Type V Belt 5/16" x 21".